Heft a 30 pound 27+ dual suspension mountain bike on to the roof rack? No thanks. Hitch racks make life so much easier. And there are so many feature-packed brands, from Kuat to Inno, Yakima to Thule. Hitch racks are great! Until you try to open your rear hatch. Or the tailgate of your truck. Or the back doors of your minivan. You've made a deal with inconvenience. Walter Anyan said no deal. He wanted a simple, reliable way to make any hitch mount rack better. Six prototypes later, Anyan was confident he had a version that was solid and reliable enough to offer to consumers. The RakAttach was born and bred in Utah. Design started in Summit Park. All of the welding and fabricating is done by MetaDesignsSLC in, yup, SLC. The steel used in the RakAttach is rolled and formed in the US. The RakAttach comes in three sizes. Small is suitable for your Subaru, Medium works well on the Explorer and Large is at home on any full-size truck, SUV or Sprinter. I am using a Large on my minivan. The operation is very simple. There is a pin that holds the rack in the unswiveled position, and a simple throw-lever that locks everything in place. Yes, you need to do both. But if you were to space one or the other, catastrophic results would not be likely. The pin can also be used to secure the rack in the opened position, which is helpful if you are on an incline. Have your Kuat 4-mount filled up with gravity bikes? No problem. The RakAttach has a 300 lb weight limit, well beyond the weight of four bikes. Even most 250cc motos, with an average curb weight of about 250 lbs, wouldn't topple this swing arm. As expected, something so sturdy is also heavy. The Large unit weighs about 55 lbs, including lock and hardware. Roughly 35 lbs for Small, 45 lbs for Medium. It is a bit awkward to install solo, and you won't want to put it on and off each week. But you won't need to, either. The rack is so quick to swing to the side. 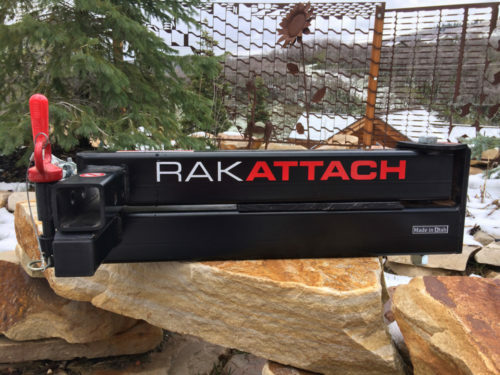 After a few days of using the RakAttach, I started feeling sorry for all those people I saw with a hitch-mount rack that aren't using the RakAttach. RakAttach is not the only swing-away rack in the game. 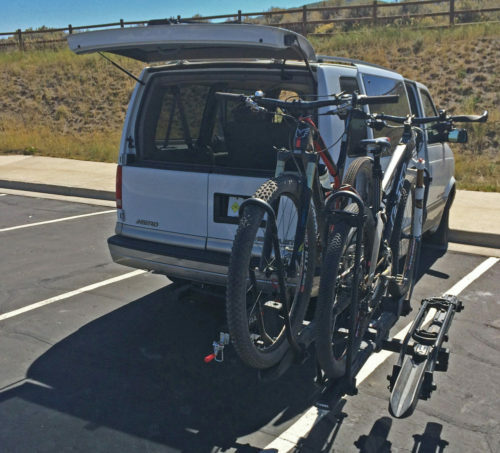 Yakima and Thule both make a rack that swings out of the way. But both those models carry bikes by the top tube. I find tray-mount better for a many reasons. They are easier to load. They work with large bikes, small bikes, bikes with sloping geometry, and dual-suspension bikes that might have an awkward shock mount. Bikes do not bang and sway. Want a tray mount that swings away? RakAttach plus your existing tray mount seems the best option. Just simple tasks that are a part of everyday ride prep are so much easier when the rack swings aside. It is great to be able to reach into the back of the van to grab a pump without needing a contortionist's skills. Going on a camping trip to the desert with bikes? Such a treat to be able to load and unload without having to remove all the bikes. RakAttach can swing to the driver side or passenger side, but that choice has to be made before you purchase. It is not possible for consumers to switch the sides. The unit comes with a locking hitch pin and an anti-rattle clamp, to securely snug the RakAttach to your vehicle. It is a good idea to recheck the clamp after the first week of use. Each unit comes with a one year warranty. A simple, strong and easy to use trailer hitch adapter that lets you swing your bike rack or cargo tray out away from the back of the vehicle.